This light and refreshing Green Quinoa Salad combines the earthy and pungent flavours of the Middle-East with the freshness of green herbs. The fresh herb paste made with fresh parsley, dill and fresh mint and extra virgin olive oil is really the star of this dish. It transform the quinoa into something completely different. The bitter flavours of the fresh herbs, arugula and green onion sing in your mouth. For some sweetness I have added dried chopped apricots and I used a Za’atar spice mix to spice things up a little. Za’atar is a dried herb mix used in Middle Eastern cuisine. It’s a real party in your mouth. There’s different variations out there but the Za’atar spice mix I use is a mix of dried wild thyme, oregano, parsley, sumak, cumin seeds and sesame seeds. It’s typically used to season meat and vegetables but I really like the tangy, herby and earthy flavour in my green salads. It really compliments the fresh herbs in this salad. 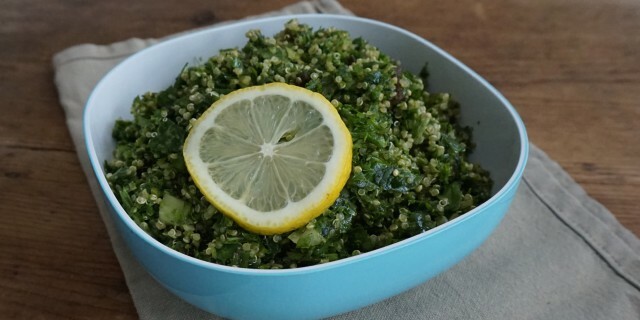 Serve this Green Quinoa Salad with a squeeze a fresh lemon juice for some acidity but make sure you add the fresh juice at the very last moment. Cook the quinoa in 8-10 minutes or until al dente. You want the quinoa to have a bite. Drain and set aside. For the herb paste, add all herbs and the olive oil to a food processor and blitz until smooth. Alternatively, chop your herbs very fine. In a large salad bowl mix the cooled down quinoa with the green onion, arugula, garlic, za’atar spice, dried apricots and herb paste. Serve the green quinoa salad in small bowls with a drizzle of extra virgin olive oil and some fresh lemon juice squeezed on top.